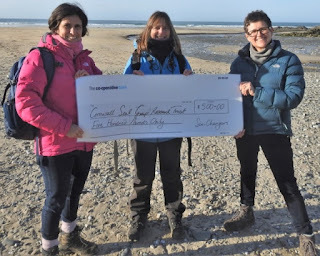 In December 2017 Sea-Changers Co-Founders, Helen Webb and Rachel Lopata were lucky enough to spend a few fantastic days in Cornwall and visit a couple of projects that Sea-Changers supported in their latest round of grants; Cornwall Seal Group Research Trust and Polzeath Marine Conservation Group. Twice a year Sea-Changers allocates grants to a range of vital marine conservation projects that are based right around UK shores. The projects are varied in aim and size but they all have one thing in common. They are run by groups or individuals who are passionate about the marine environment and really want to have a positive impact on marine conservation. The two projects we visited were no exception to this. 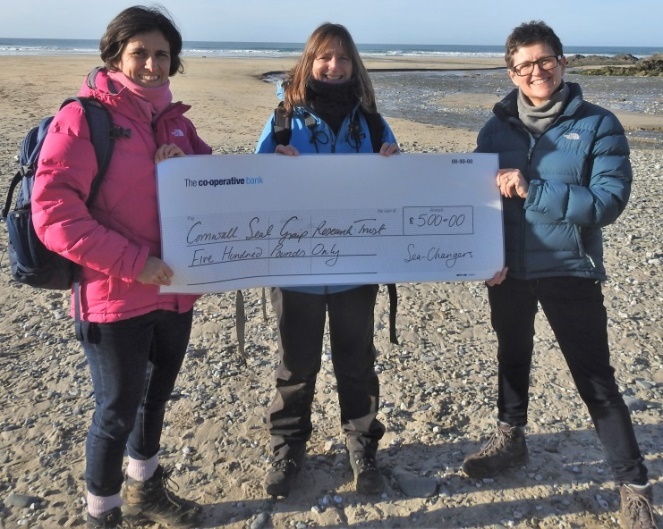 Who are Cornwall Seal Group Research Trust? Cornwall Seal Group Research Trust (CSGRT) is an evidence based conservation charity (founded in 2004) supporting a large network of active citizen scientists across the south west UK routinely surveying seals on their local patch. This enables CSGRT to learn more about grey seals, a globally rare marine mammal that the UK has a special legal responsibility to protect. 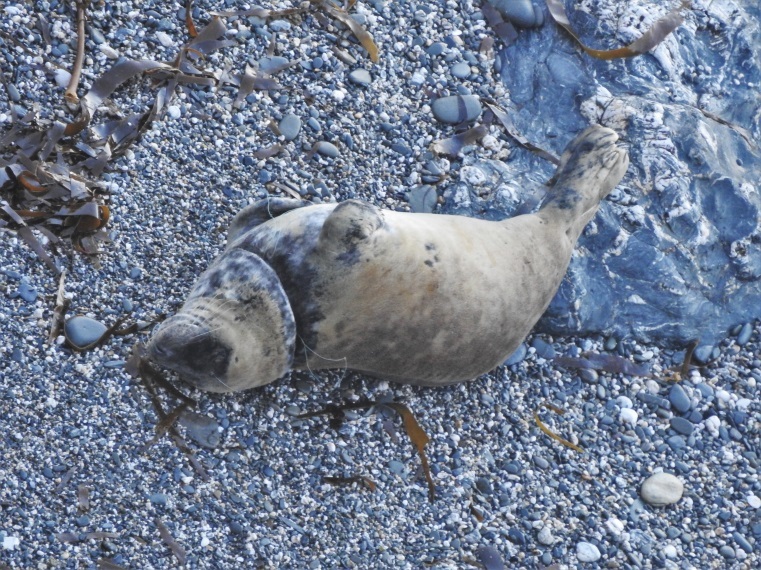 Over the past 17 years they have encouraged everyone to send in their seal sightings with a date and location enabling CSGRT to build grey seal photo ID catalogues of each individual’s unique fur pattern effectively tracking them for life. Boat surveys gather important data from numerous offshore islands within the Marine Conservation Zones (MCZs). Understanding how seals move through MCZs across the Celtic Sea is key to informing conservation and management. CSGRT monitors three designated MCZs within 115km of the north Cornish coast recording all marine megafauna and the quality and condition of habitat. The Sea-Changers grant will fund one of their 12 vital annual boat surveys. The information gathered is analysed and summarised in a formal report for each survey and made available free to groups and agencies that need the data and to help our government formulate and manage maritime protection. We met Mike and Sue from the CSGRT at a seal site in West Cornwall. The site is based on National Trust property and they are keen to ensure some protection to the seals and so don’t publicly publish the site details – so we won’t either. Too much human activity can and does spook the seals. We met Sue Sayer, Founder of the charity and walked to the secluded beach. 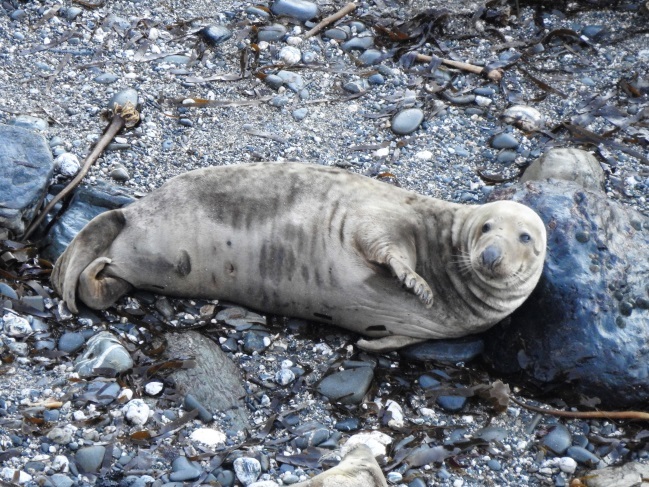 The site that greeted us was mind blowing and wonderful – lots of seals lazing on the beach. We settled down with Mike and Sue to watch the seals. I’ll be honest and say at first glance there does not look to be much activity but when you take time to settle, watch and observe it was fascinating: seals, playing in the water, play fighting with each other, moving around to find a good spot on the beach, snoozing, watching. And every seal is so different in color, size, markings. I imagine if you get to know them through regular visits you would identify different personalities too. Many of the seals were ones that Mike and Sue recognised from previous surveys. Some were seals they has rescued from plastic that had been caught around their necks. It was shocking to able to see so many seals on the beach who have been affected by human activity with scars around their necks or still caught by fisheries related plastic. Adult male seal chilling and appearing to wave at Sea-Change visitors! Sea-Changers present CSGRT with their boat survey enabling cheque. Juvenile seal entangled in monofilament fishing net, CSGRT will aim to work with British Divers Marine Life Rescue to free this seal from its life threatening noose. Who are Polzeath Marine Conservation Group? 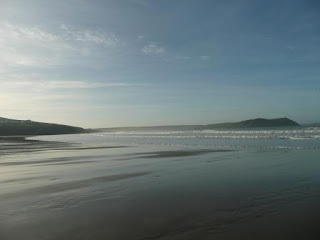 The Polzeath Marine Conservation Group is passionate about protecting and enhancing the special marine environment in Polzeath. The Group runs a wide range of fun and informative activities around Polzeath, as well as hands on conservation action, and hopes to raise awareness of the wealth of marine life living there, its importance and how everyone can work together to help protect it. The Sea-Changers grant will contribute to the cost of an Outdoor Tubular Bottle Filling Station. This will be installed at the top of Polzeath Beach and be accessible to everyone. Visitors and the local community will have access to quick, easy, clean drinking water. Water bottles can be refilled instead of purchasing more bottled water. 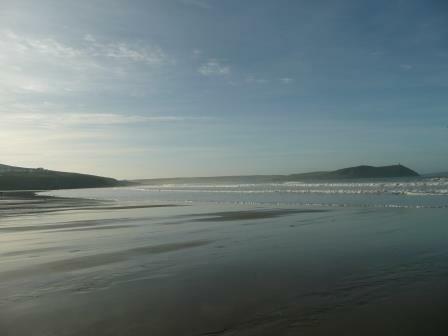 Polzeath is an area of outstanding natural beauty and in a marine conservation zone. During the summer, plastic litter soars as tourists and the local community enjoy the beautiful beach. At present there are no sources of drinking water available to the public. Thousands of tourists who arrive on Polzeath Beach during the summer either bring an adequate supply of water with them to the beach or buy bottled water from take away cafes etc. The council owned beach rubbish bins soon overflow with waste people leave behind, so with the action of gulls and the tides it ends up in the sea. It is hoped that this initiative will be sustained by encouraging similar groups to install water stations on their Cornish beaches. We met with a number of volunteers from Polzeath Marine Conservation Group (PMCG) including Tina Robinson who runs the project. Like the CSGRT (and Sea-Changers) this is a volunteer run group that would not exist without the personal energy and commitment of some great and really knowledgeable people. They operate from a small building just off Polzeath Beach which contains a lovely exhibition and as well as installing the water fountain they run regular education events such as rock pooling rambles and organise beach clean activities. 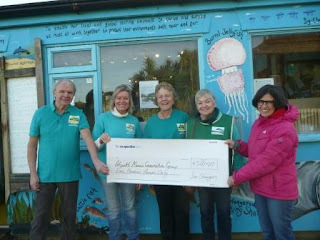 If you are in Polzeath during the warmer months do pop along to their marine centre, say hello and have a look around. As likeminded organisations CSGRT and PMCG collaborate on numerous projects including sharing the organisation and analysis of one of the sections surveyed by boat. Partnership work increases value for money and has a much greater impact. It is something Sea-Changers love and would like to see happening all around UK coasts. Over the past five years Sea-Changers has funded over 100 amazing projects around the UK. We would love to go and meet all the projects we fund, thank the people involved for all the hard work, learn more about why they want to make a difference to our seas, what drives them to do this often with little or no financial reward but we, as volunteers ourselves simply don’t have the time or resources to do that. But it was fantastic to spend a couple of days in Cornwall and meet up with wonderful people like Sue, Mike and Tina and hear about the amazing work they are doing. On days when I read another report about problems in the oceans, I can feel motivated and inspired by them, and other people like them who are doing so much to keep our seas healthy and be Sea-Changers. To find out more about CSGRT visit their website. To find out more about Polzeath Marine Conservation Group Please visit their website. An article is a kind of adjective. They are always used to give details on any selected topic. In an article it is important to use the English accurately. Different kinds of article structures are there. I like the one which you have used for your article. It requires a good experience to write such a great quality post. I have gone through all of your articles; I have noticed one thing that you are always sure about your content. It is really a positive thing you can give to your reader. Your posts make us to read further in an interesting way. Keep sharing more. Thank you. If your essays are good but not great, using these tips and techniques will help take your writing to the next level. Our essay writer will help you to reach your high level.